Without pride to anchor in life, we are lost. 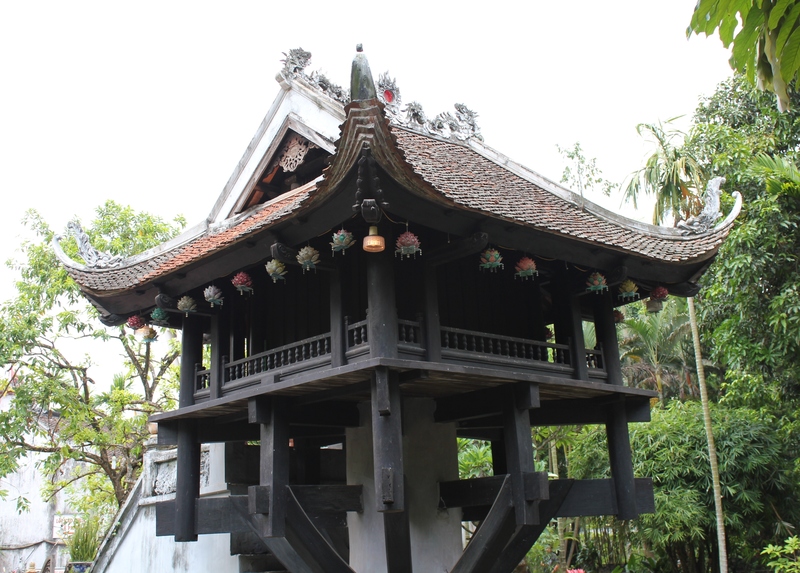 It is true that chùa Một Cột is a small structure. Yet, what is unique about chùa Một Cột is not so much its size as the architectural concept this 11th century structure embodies. Those who know its true value would be so infuriated to hear the above comment they’d want to curse the tourists for their ignorance and arrogance. Chùa Một Cột was built in the reign of Emperor Lý Thái Tông (1028-1054) in 1049. The story has it that the Emperor dreamed of the Female Buddha who invited him into the lotus flower. He later was blessed with an heir. To commemorate the event, the Emperor commanded the building of chùa Một Cột in the imagery of the lotus flower that he saw in his dream: an altar on top of a stone pole rising above the water in the middle of a pond. The whole structure is small in size, indeed: a square altar, three meters long on each side, held up by a single pillar 4 meters high and 1.2 meters in diameter. In 2012, chùa Một Cột was listed in the Asia Book of Records as one of the most unique architectures in Asia, among its other records in Vietnam. Legend and accolades combined, they only explain the history and the shape of chùa Một Cột but do not satisfy the architectural curiosity about its uniqueness. Visually, chùa Một Cột definitely has a striking shape which, still, by no means explain the historical fact that the French, even on their hurried retreat from Hà Nội in 1954, did not forget to detonate the structure! What is it about this one-pillar pagoda that excited such damnation? Let’s imagine, 11th century, human kinds were still very much living in the dark with ‘witches’ and ‘magic,’ to say the least. 14th century, Black Death wiped out 30-60% of the population in Europe. The building technique back then, or even now, mostly follows the familiar concept of gravity which prescribes the ‘big bottom tiny top’ structures, small or large. Think of the pyramids or the Eiffel Tower. Chùa Một Cột was built in the 11th century in Vietnam based on a completely different principle, against the norm, against nature, against the concept of gravity: big top tiny bottom. Think of a reversed pyramid on its pointed top. The new concept is revolutionary in itself, let alone the actual realization of the building. In the case of chùa Một Cột, the stone pillar upon which the altar rests is five times smaller than the altar itself, at the ratio of 1.2 : 6. 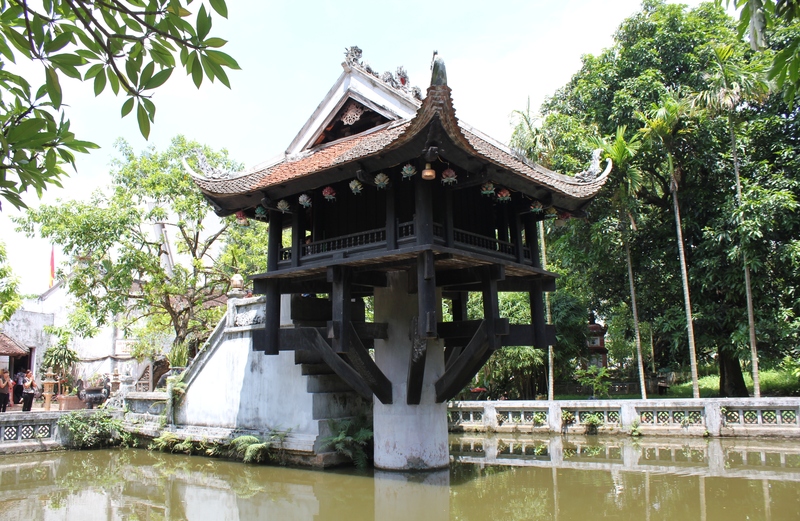 Not until the early 20th century did modern men approach the idea of ‘against gravity’ building realized in the structure of chùa Một Cột almost a thousand years earlier. 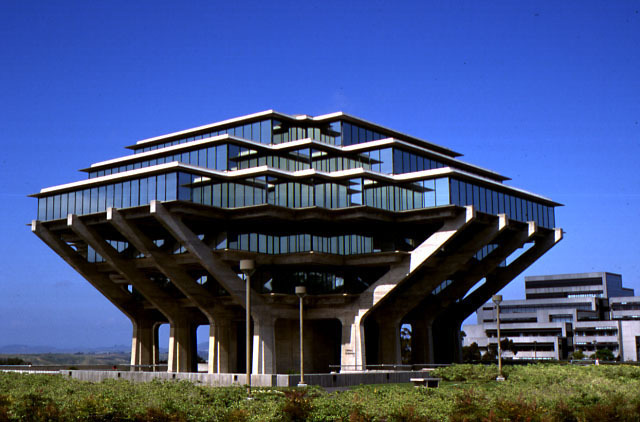 The first modern architecture modeling on the new concept is the Geisel Library at UC San Diego. Designed by William Pereira and open to the public in 1970. Another structure even more highly visible of this conceptual embodiment is the performing arts center called The Egg in Albany, NY. 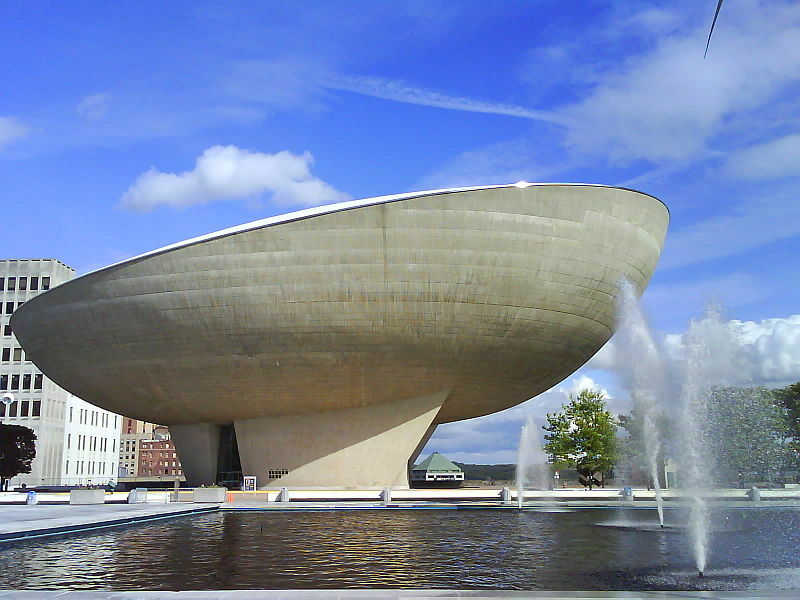 The Egg is designed by Harrison & Abramovitz as part of the Empire State Plaza, finished in 1978. Now that the architectural concept of chùa Một Cột is put in the proper perspective, its true value is revealed. As a futuristic monument a thousand years ahead of its time, chùa Một Cột is not only unique in Asia but in the world as well. No modesty is necessary in this case. What does all this make the French? Let’s see: The first ‘anti-gravity’ building was built in the US in 1970, while the French blew up chùa Một Cột in 1954. They were pretty ‘futuristic’ themselves back then, being able to see the timeless value of chùa Một Cột in order to plan on sending it to oblivion! Luckily, their plan failed. The original drawing of chùa Một Cột was found and chùa Một Cột was rebuilt in 1955. Chùa Một Cột is an example of exceptional Vietnamese ingenuity. I think of it as a pillar of pride. It anchors me in life, in my faith for Vietnamese culture and people. In spite of its ancient past, its symbolic meaning is forever strong and young in my eyes as I am assembling my present and future with crumbles around me. There is no other way for Vietnam to acquire a glory past that the future generations can look back with pride but for us, the 21st century folks, to pull up our sleeves and create one in the present – right now. With pride to anchor in life, one is sure to find their way. What is your pillar of pride? Previous Tiên sư cha chúng nó! Next Sài Gòn-Việt Nam: Feel free to hug!